A reflection for the Feast of the Holy Family, year B. The readings are Sirach 3:2-6, 12-14; Psalm 128, Col. 3:12-21 and Luke 2:22-40. “Now master, you may let your servant go in peace.” Those are the beautiful words of Simeon from today’s Gospel reading. It’s a beautiful canticle, one of three in the Gospel of Luke that is prayed every day in the Liturgy of the Hours. This one is prayed during night prayer by all priests and people in consecrated life. But it’s a little strange that this is the Gospel reading for today, because today is not the feast of the Presentation of the Lord – that’s not until February 2nd! Today we celebrate the Feast of the Holy Family. In other years the Gospel for today is the finding of the child Jesus in the temple (Luke 2:41-52) or the flight of the Holy Family to Egypt (Matthew 2:13-23). But this year, it’s this one: the presentation of Jesus in the Temple (Luke 2:22-40). It must be that there are some family lessons that can be learned from this reading. In fact, I want to share with you some family lessons that I can see in this reading. Even if you really, really like your family and it’s a pretty functional family, no family is perfect. In fact, statistics say that almost 40% of families are mildly dysfunctional; 16% are moderately dysfunctional and 2% are severely dysfunctional. These are families where there is some type of dysfunction: abuse, neglect, violence, addiction, mental illness, constant conflict or misbehaviour, which the members of that family consider normal. That’s very sad because family is God’s idea. God is the God of family. Family is how God chose to have each and every one of us come into the world. All of us, no matter what our situation, were born into a family – dysfunctional, traditional or other. So special is the family to God that He himself chose to come into the world as a little baby, born into a family. 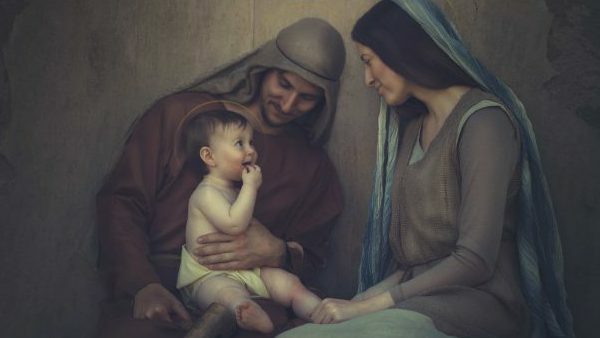 And so we have this Holy Family – the perfect family, some think. I don’t think so. I don’t think the Holy Family was perfect, because no family is. Did Mary and Joseph ever have any disagreements? Sure. If they ever went grocery shopping together, I’m sure they had disagreements! What was that like when they lost Jesus? “I thought he was with you.” “No, he was with you.” Did they have to deal with stress or crisis in their life? The first crisis began even before Jesus was born. So… was it perfect? Did Mary and Joseph not worry about their son? Don’t you think Joseph had to tell Jesus to eat his vegetables? If Jesus had a sleepover didn’t Joseph have to go into the kids’ room at one in the morning to tell them to stop talking and go to sleep? I think the Holy Family was as normal as families can be. And even if they weren’t, at least for me, it’s good to think that they were like my family. That way I have something to learn from them. You want your family to be holy like the Holy Family? Here are five practices that I think we can learn just from the readings today. This is fairly obvious. It’s what Joseph and Mary are doing in today’s Gospel story. They are following the prescripts of the law. They are doing their religious duty. They are being religious. It’s good for families to have religion. To pray together. To go to Church together. Bring your kids to Mass. Doesn’t matter if they are noisy. Bring them and sit in front so they can see. Being connected to the greater family of God is good for the family. If you want your family to be holy, do religion. If you pay attention to the reading, you’ll notice that Mary and Joseph never say anything. They just do what they have to do and they are amazed at what was said about their son. They don’t get impatient with this old stranger that takes their kid. They’re not rude with him. And this is probably what was typical in the family of Joseph and Mary. They were patient and kind. It’s the virtues that St. Paul suggests to the Colossians in today’s second reading: “Clothe yourselves with compassion, kindness, humility, gentleness and patience” – forgiving one another and being thankful. I think that these virtues were practiced by the Holy Family. But how do we become kind and patient and compassionate and forgiving? That doesn’t happen automatically when we are baptised. You are not automatically kind and compassionate and patient just because you are a Christian. We have to learn those things. How do we learn them? In the family. I am a big believer in a home that only has one TV. Why? So that the kids learn to share. Try having a house with just one bathroom… you learn to share; you learn patience. Our job as parents is not to make our kids happy. Our job as parents is to make sure that they grow up to be healthy and holy adults. So we have to teach them to be patient, to be compassionate, to be kind, to be gentle. We do that by giving them clear structures and boundaries, and giving them real consequences to their behaviour. It means letting them experience hurt and disappointment; challenging them and disciplining them. You want your children to learn how to be family? Take them grocery shopping with you every week. Pope Francis says that the family is a school of love. That’s the second lesson today. You want your family to be holy; practice virtues and teach virtues. The second lesson also comes out of the fact that Mary and Joseph are silent. They meet an older person. They offer him respect. They listen to his wisdom. This is what today’s first reading is getting at. Honour your father and mother. But it’s more than that: honour your grandparents; honour your elders. That’s something else that we cannot learn out of the family: how to deal with people who are much older than us. In the family we have parents, we have grandparents, we have uncles and great aunts… and Pope Francis is also always reminding young people to speak with their grandparents, to listen to them. You want a holy family? Make sure that there are grandparents or grandparent figures in your kids’ lives. The third lesson is the fact that Mary and Joseph are silent. Consider this: can you be an effective parent, an effective teacher without talking so much? There was a study done that said that the #1 complaint parents of teen-agers had was that their kids didn’t talk to them. The #1 complaint teen-agers had was that parents didn’t listen to them. So how does that work? Kids want to be heard and parents want their kids to talk to them. So what’s missing in this picture? It’s that parents don’t know how to listen. Do you know what part of your body you listen with? Not your ears; your eyes. We listen with our eyes. If my son comes home from school, grunts a hello and goes into his room slamming the door, I don’t need him to talk to me to tell me something’s wrong. If I’m paying attention, I know something’s wrong. So, the family is a school of love; we learn wisdom from our parents and grandparents; and parents, try just being with your kids without always telling them stuff, teaching them stuff, preaching to them. Your kids are not going to learn kindness, compassion, patience and forgiveness from you telling them. They will learn it from watching you live those virtues. As they say, “virtues are caught, not taught.” If you want your family to be holy practice what you preach, stop talking so much and listen to and pay attention to your kids. 5. Who is the protagonist in your family story? It may seem that Simeon is the protagonist of today’s Gospel story. He’s the only one who speaks. Jesus obviously doesn’t speak; he’s just a baby. But who is at the centre of this story? It’s Jesus. You want your family to be holy, put Jesus at the centre of your family life. The family is a school where we learn to love. The mission of every family is to raise holy people. That has to be the mission of every parent. We achieve that by making the family a school of love. That has to be the mission of every husband and wife – that’s why I don’t have a problem with this idea that wives need to be submissive to their husbands (Col 3:18-21). To be submissive means to be ‘under the mission’ of’ someone. So if the husband’s mission is to love their wives (and in Ephesians 5:25 Paul says we have to love our wives just as Christ loved the Church) and to want the holiness of the wife and family; what wife doesn’t want to be under that mission? We all need to be submissive to love. Let’s make our families holy by practicing our religion and by turning our families into factories of love. Practice respect for our elders: Children, listen to the wisdom of your parents and elders; parents, practice silence: trust in the silence, and put Christ at the centre of your family story. Then our children, like the Christ child, will also grow up in strength, filled with wisdom and the favour of God will be with them.